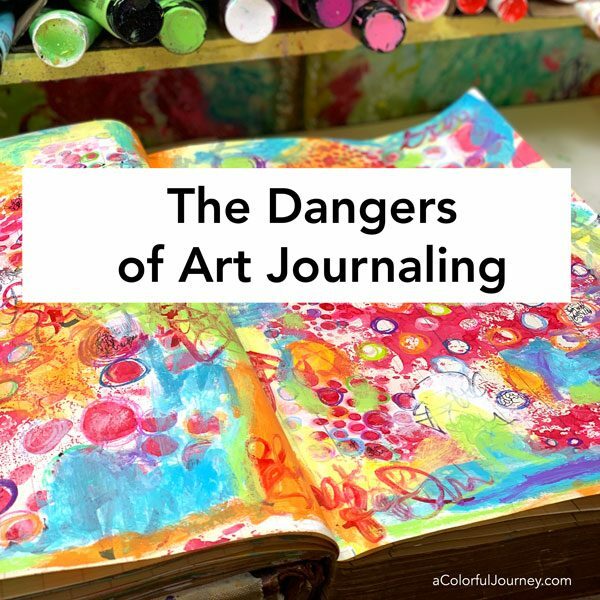 There are dangers to beware of when art journaling. You’re not in danger, actually the opposite because art play is soul nourishment and a way to release stress. But it can rather hazardous to certain art supplies. 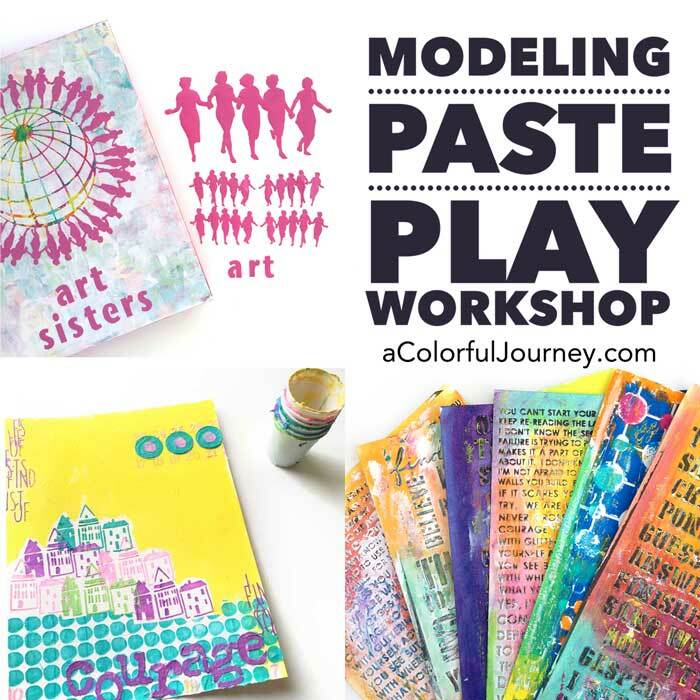 One art supply isn’t gonna make it out of this play alive- see what happens in the video. I’m playing in a giant 150 year old ledger I call MoJo. The first layer is just one stencil, Speckles and Spots, and Art Spray. 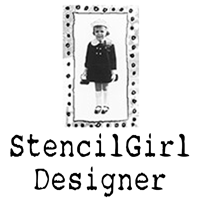 The stencil has 3 different sizes of circles so it looks like I used all sorts of stencils here, but it was really just one. Why use Art Spray for an early layer? Because it won’t bleed through the layers or reactivate when once it’s dry. That means I can put paint on top and it won’t come through. 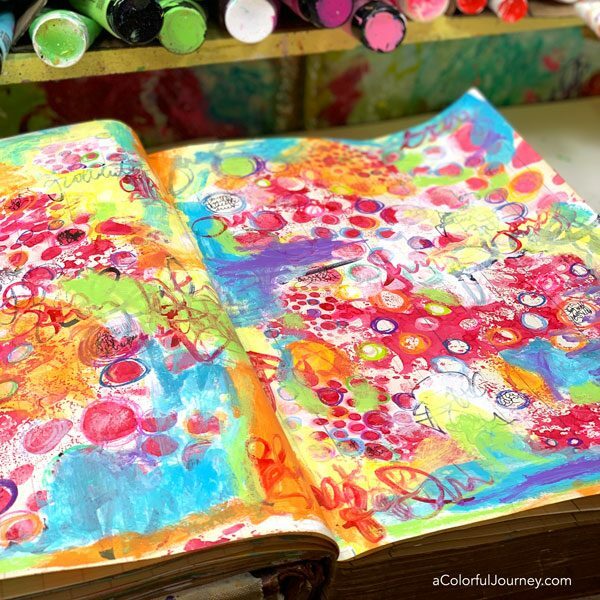 The journal I’m working in is a 150 year ledger- you can see more about it here- so the Art Spray is taking a while to dry. 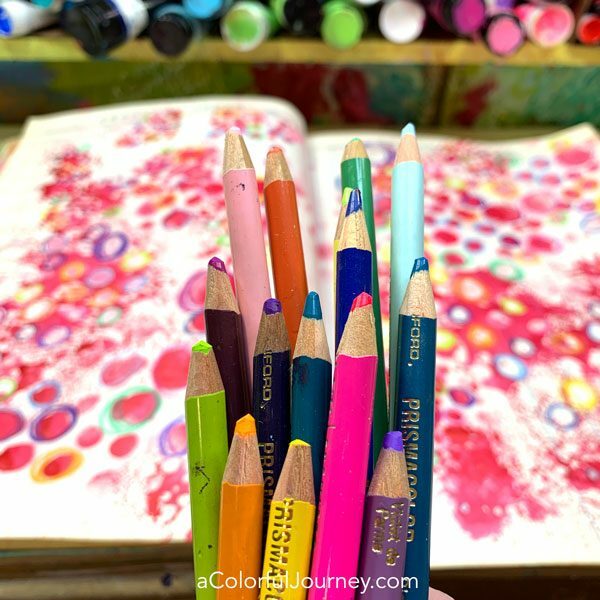 There are parts that are still wet but that won’t matter with colored pencils. How did I choose this exact brush and why? If I’m doing a small area, I’m going to grab a small brush and if I’m doing a large area, I’m going to grab a bigger brush. There’s something even more important though than the big brush/little brush factor… which brush is clean. All my other larger brushes were in the yucky paint water, and since I was about to use white, I needed a clean one. So, whichever brush was about the right size is the perfect one. The brave and valiant Sharpie hung in there for a while, but the wet paint was just too much for it. So, that’s why I grabbed the really jumbo one. Guess you know why I buy my Sharpies in multi packs now. Along with all the paint and Art Spray, oil pastels were added in some spots. Yes, oil pastels on top of acrylic paint. 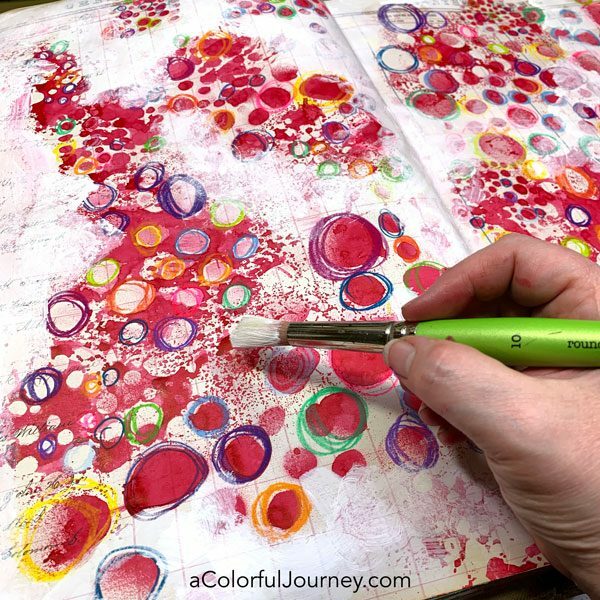 When adding a fluid something on top of oil pastels, it beads up and creates a different look. I love that and do it on purpose. As I brushed on some of the Art Spray over the oil pastel, you can see how it beaded up. You’re not supposed to do that but I do it anyway. After all, this is play and not brain surgery. 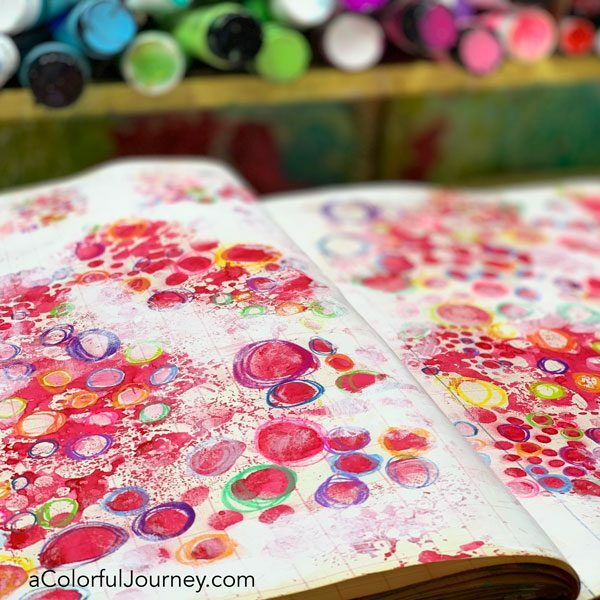 It’s about having fun using art supplies! 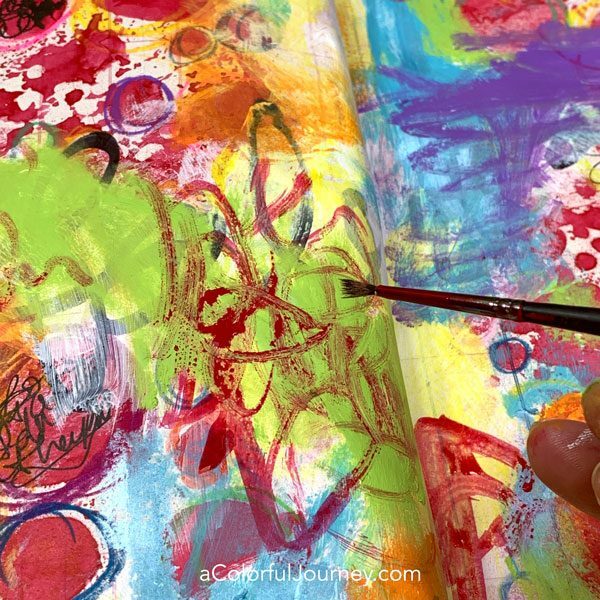 If you want to feel that freedom of play then I encourage you to check out my free online workshop called Permission to Play. 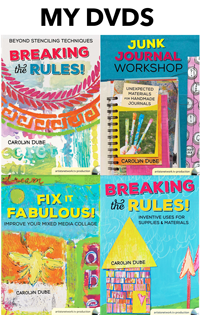 In there I’ve got downloadable goodies for you and specific strategies, things that you can do to let loose to really get into the play and just have fun making and creating. 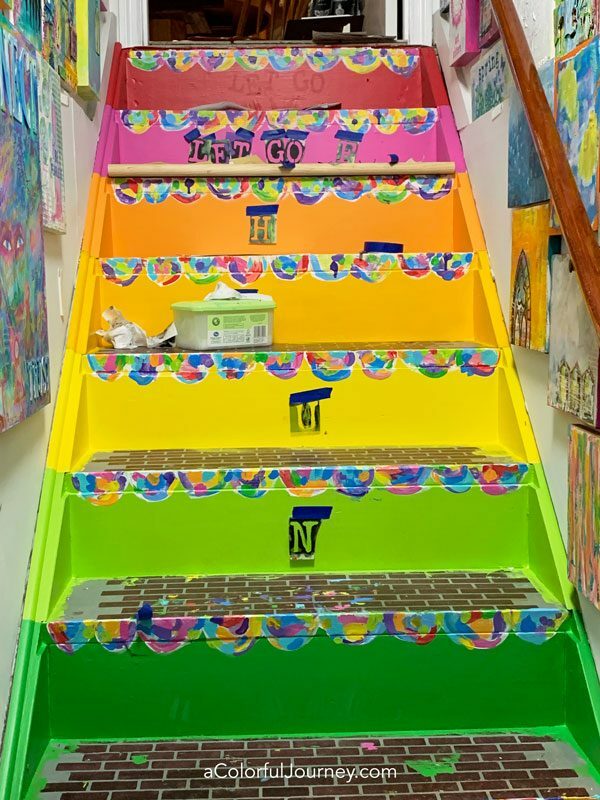 At long last, this year, I finally updated my painted stairs. 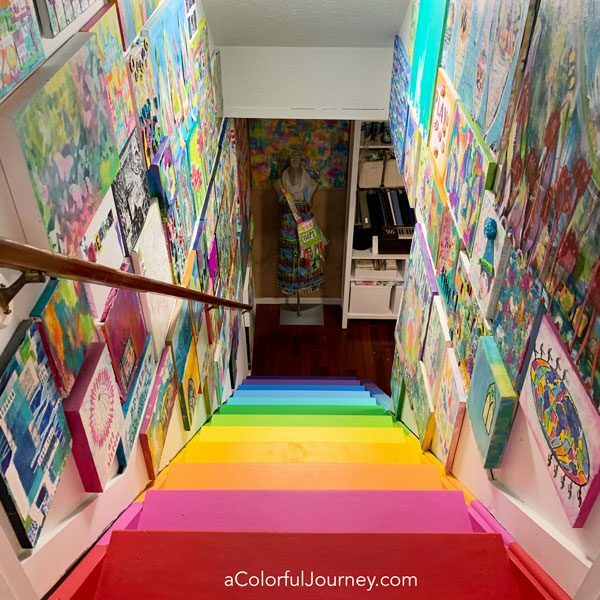 These are the stairs I walk on every day to get to the studio and now that they’re colorful, I wonder why it took me so long to make time to do this! What I learned and the OOPS or two along the way are all in the video. Use a floor paint. 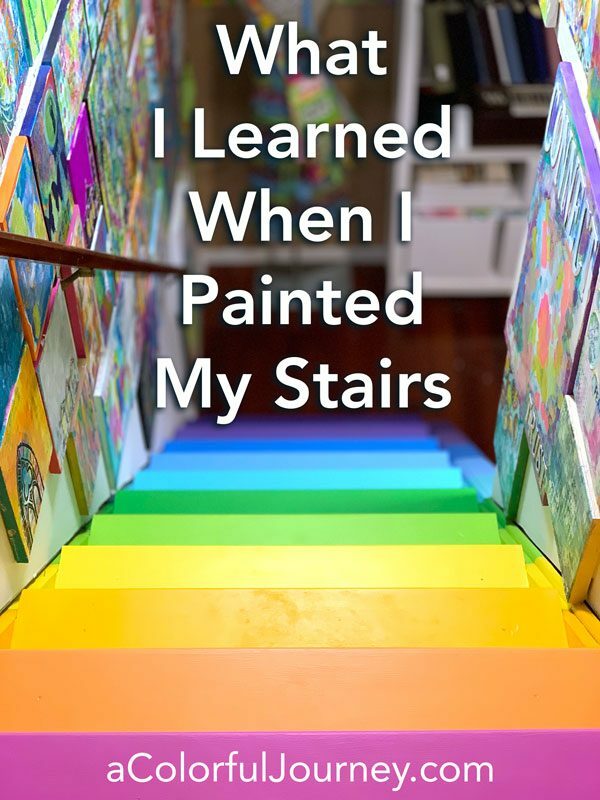 Stairs get a lot of wear and tear and need a very durable paint to look good over the long haul. 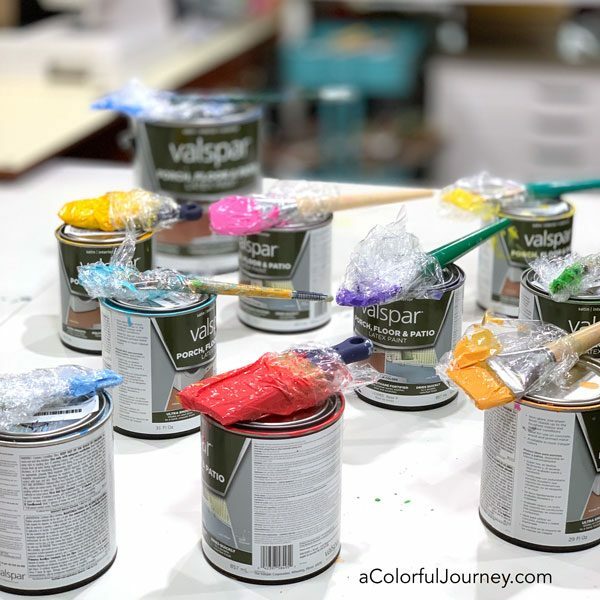 I used Valspar Porch, Floor, and Patio paint. To save myself some brush cleaning, I wrapped the brushes in plastic wrap so I could skip cleaning them at the end of the day. The whole process took 2- 3 days and it was a real time saver to not have to wash so many brushes out after each coat. 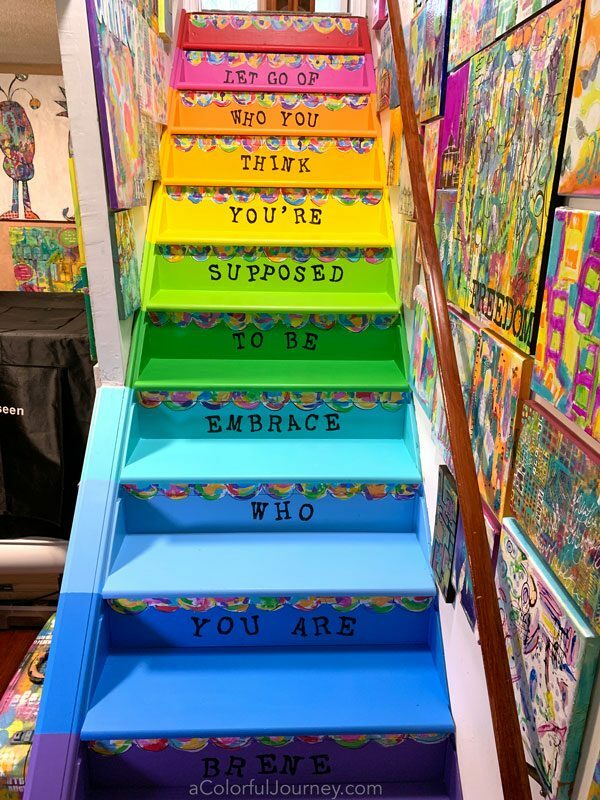 It’s wise to prime the stairs. 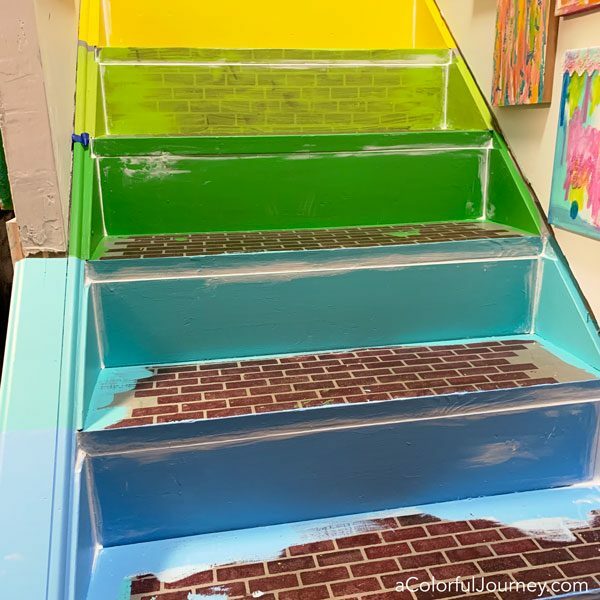 I was painting over a faux brick pattern and was too impatient to prime it. I wish I had taken that time early on to save me the extra coats it took to cover it up. 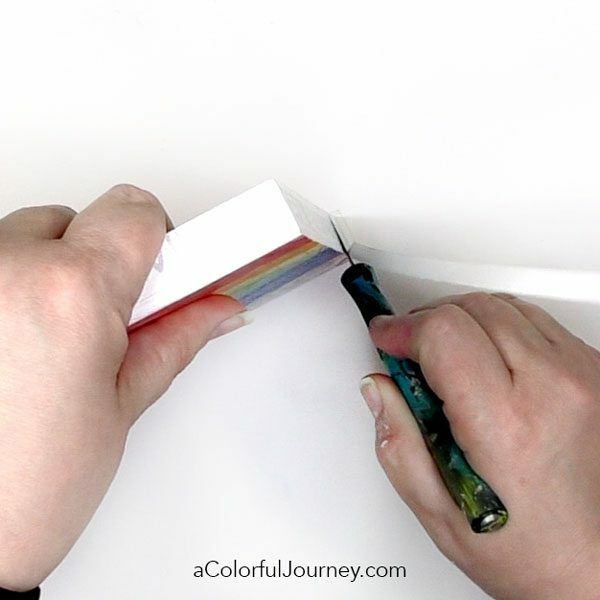 If there are gaps between your boards you can fill them in with a flexible caulk. Be sure that it is a caulk for indoor use and it’s paintable. There were plenty of gaps on these stairs since I think these were originally intended to be carpeted. Start, even if you don’t have a clear or exact plan. 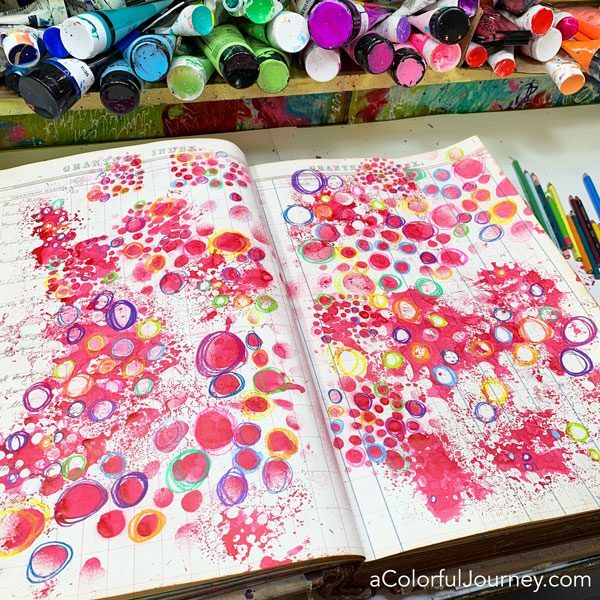 Just get paint in colors you love and start. It’s only paint, so if you change your mind you can paint right over it. There wasn’t a clear plan for me when I started. I wanted a quote and color and once I got started, then the idea of the scallops came to me. But that only happened because I got started. You might not be able to see the entire quote or pattern from the bottom. When you get to the bottom of my stairs, you have to take a quick turn. So there isn’t much room to stand back which means I couldn’t read the first line of the quote at all if I started on the top step. You can see the ghost of the Let Go that I started up on the red step. After I stenciled I went to the bottom of the stairs, and totally couldn’t see it. A baby wipe removed 95% of the paint but you could still see it. Was that a mistake? Nope. 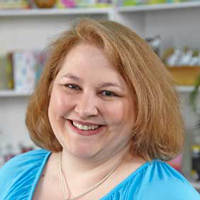 It’s An O.O.P.S., an Outstanding Opportunity Presenting Suddenly. It’s a bonus reminder to let go of trying to make something perfect. Embrace who you are. If you’re an engineer who likes things mathematically straight, then do that. If your lines are never straight or even no matter what you do, then don’t line anything up! Bet you can guess which one I am. 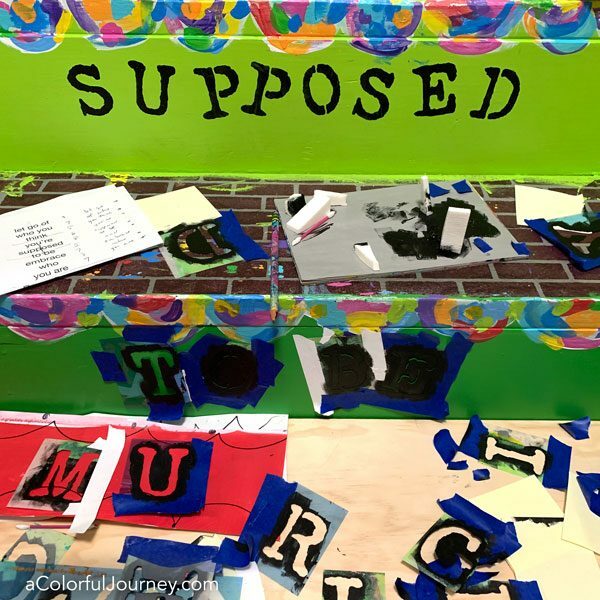 To make it easy to stencil the words, I cut apart the Vintage Typewriter Alphabet Jumbo stencils (A-P & Q-Z) that I designed for StencilGirl. Then I taped them on with painters tape. The risers won’t be walked on so use whatever you have on there. 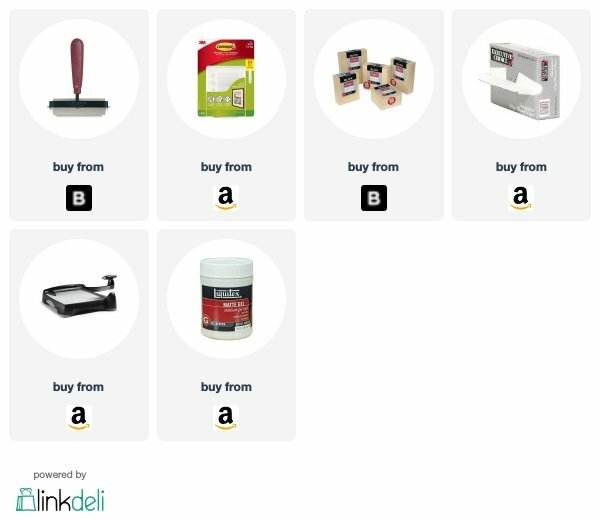 I didn’t buy black floor paint so what could I do? I used what I had, which was black acrylic paint that I use in my mixed media art. The finishing touches on the scallops were so much easier to do with ink than paint. Nobody will be walking on the black so it isn’t a big deal. Make it safe to walk on. Fancy patterns can look cool but can be an adventure to walk on. I’m no spring kitten so I chose to avoid optical illusions that make it hard to see where I’m stepping. Solid areas of light colors show dirt faster than a darker color or a pattern. 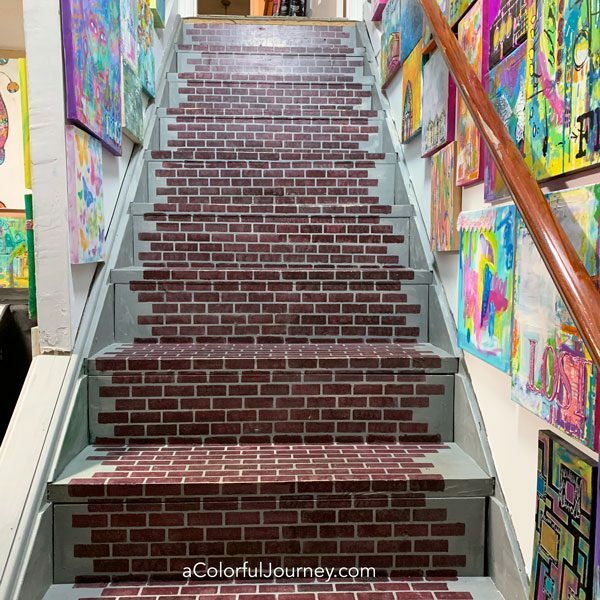 Have an escape plan if you paint the entire staircase at once, otherwise, you’re stuck there until the stairs dry. 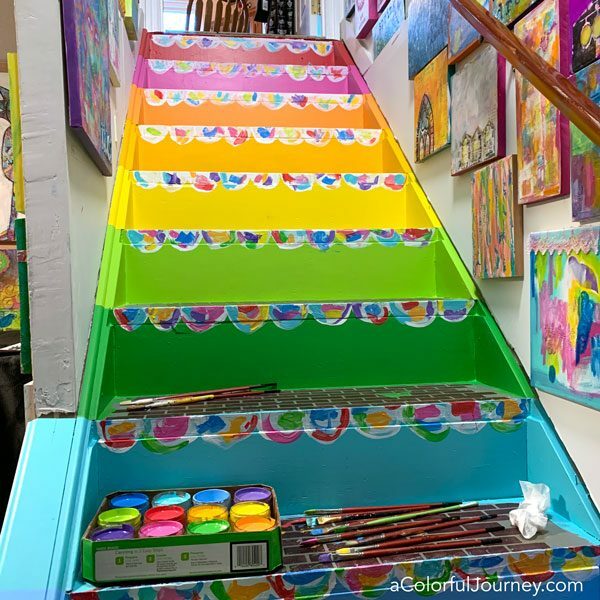 If you don’t have another way out of the room or area, then paint every other stair so you can step over any wet paint. Choose a quote that is meaningful to you. Every time you go up the stairs, you’ll be seeing these words. Even if you don’t read them aloud, your subconscious will noticing them. 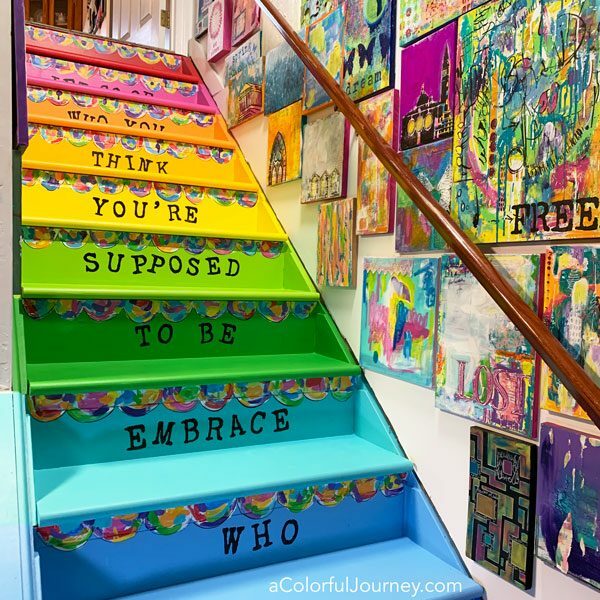 I chose this quote because it is about accepting who you are, not worrying about all the shoulds and musts that come as part of the baggage of growing up. 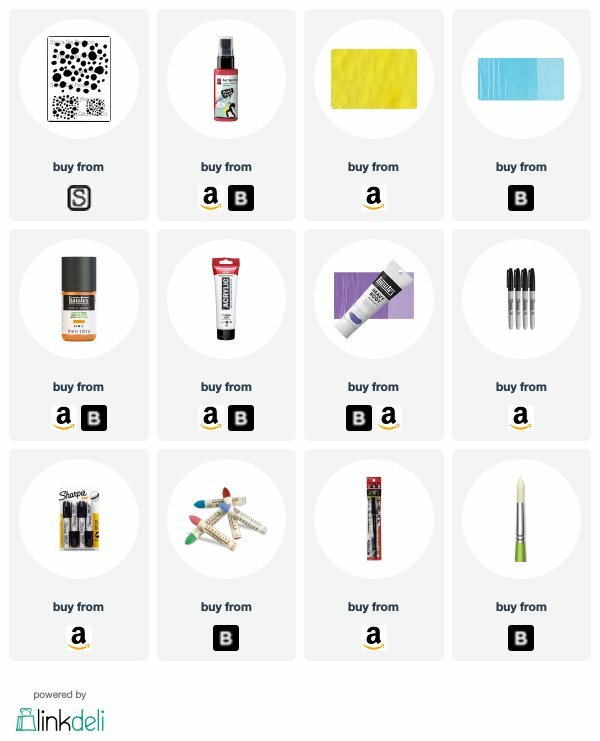 Whenever I get my art supplies out, when I am creating, I feel like the true me. So when I leave my art studio I now have a reminder to bring that feeling with me and keep me grounded in who I truly am. 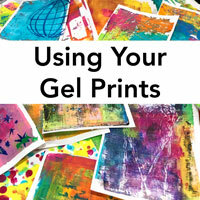 What can you do with that gel print that you loved the instant you lifted it off your plate? Put it on your wall! I’m not a huge fan of frames, or I should say that I love big expensive frames that are out of my budget. So I prefer to mount prints on wood panels. I’m using an 8 x 10 wood panel and an 8 x 10 gel plate, so no need to measure. But how do I get it to match up perfectly? Measuring is out because no matter how many times or ways I measure, it never comes out right. But there is a way to get the edges all lined up, without any measuring! How did I create the print? 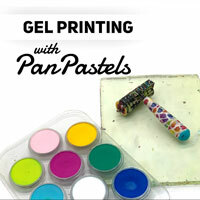 Using the techniques from my online workshop, Gel Printing with PanPastels. 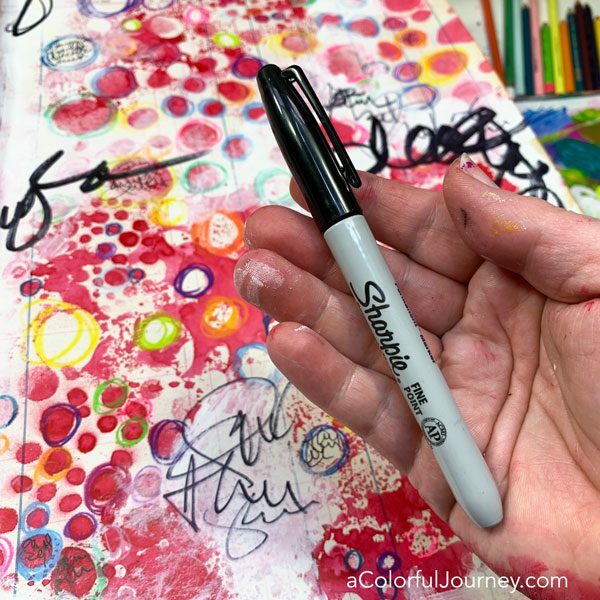 The patterns that I used for the clouds is one of the included downloads – along with 3 bonus videos and more- you can get all the details here. Step 1: Get the wood panel ready by gessoing and or painting the sides. 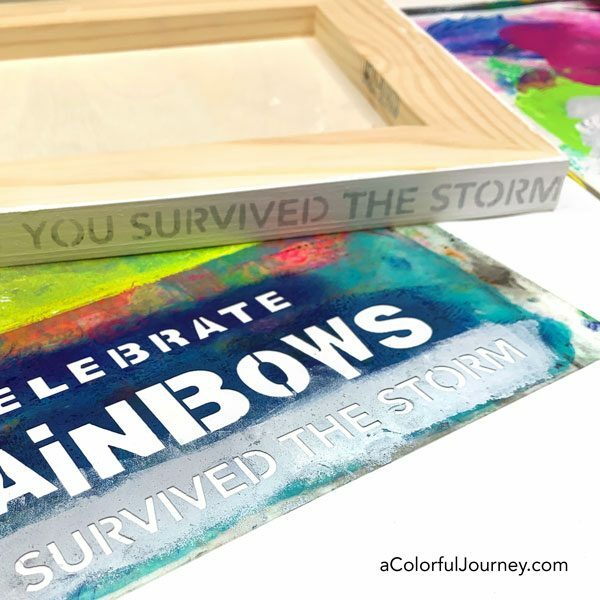 I painted the sides white and then added some stenciled text on the side that matched the feeling of the print. 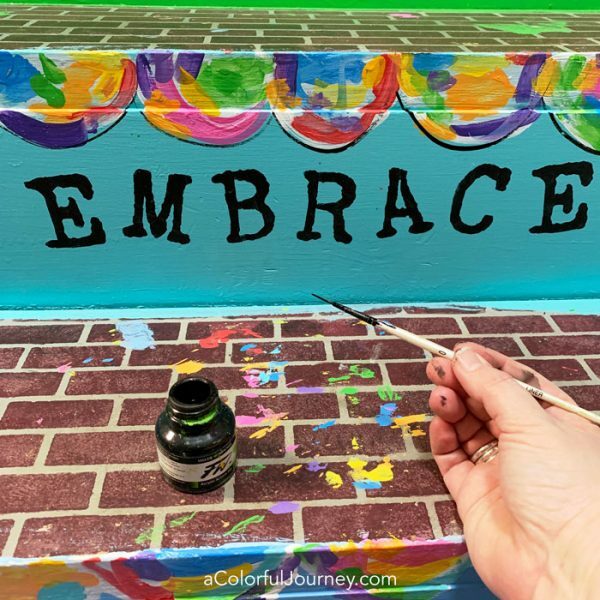 This idea was sparked by a photos Kim Geiser shared on her Instagram account. Step 2: Trim 2 sides of the print. You don’t need to measure, just be sure to get straight cuts. Only one corner will be trimmed, the other 3 will be cut after it is glued to the wood panel. Step 3: Attach the print to the wood panel with gel medium. Spread it evenly on the wood panel and to the back of the print. 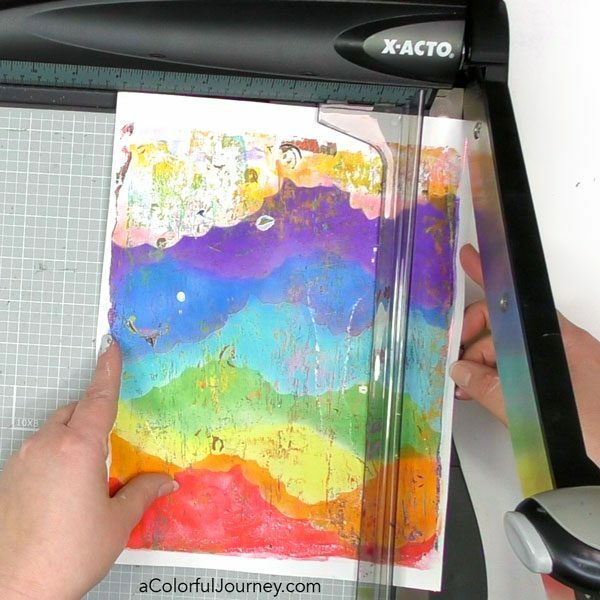 The print only needs a thin layer but be sure to get it all the way to the edges. You have a moment or two of wiggle room once you put the print on the panel, so be sure that the corner you trimmed and the 2 sides you trimmed are lined up as flush as possible. 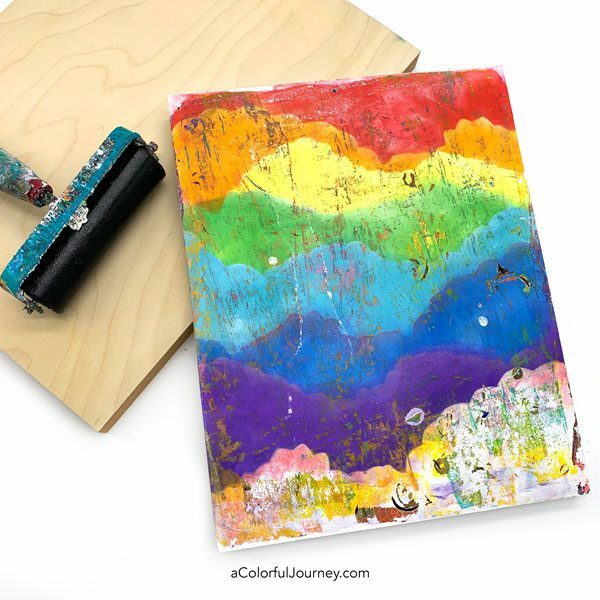 Then put a protective piece of paper on top and brayer over it. 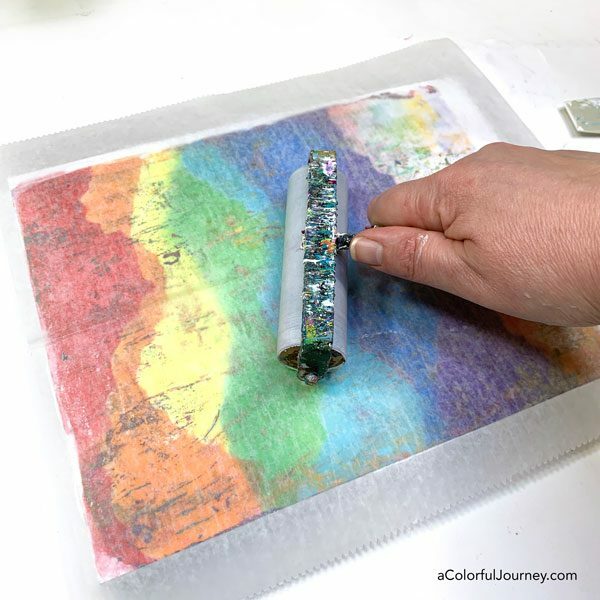 This will push the paper flat to the wood and squeeze out any excess gel medium. 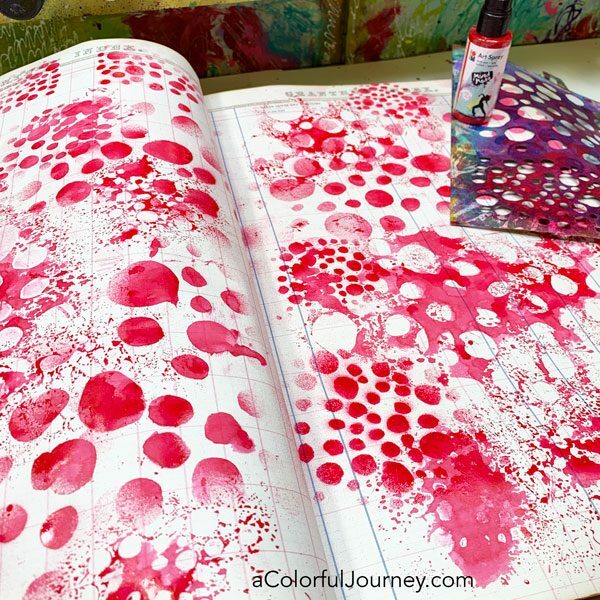 Wipe off any gel medium that squirts out. Step 4: Put a protective something on the print, like freezer paper, then stack something flat and heavy on it. This will keep it from getting any bubbles or warping while it dried. Then the hard part- wait overnight for it to completely dry. Step 5: Trim off the excess paper. It must be completely dry for the blade to cut it smoothly. Also, a fresh blade is extremely helpful for getting a clean cut. Hold the blade flat against the wood and then use a sawing motion to cut the the paper. Step 6: Put the mounting hardware on it. By mounting hardware, I mean a Command Adhesive Picture Hanging strip.